Spanish Red Wine D.O. Product of Spain. Juicy red and dark fruit flavours with hints of spice and a soft juicy finish. 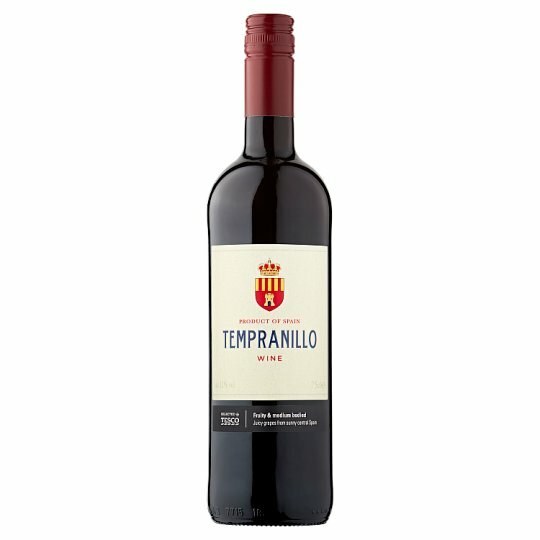 Made from Tempranillo grapes grown in the Valdepeñas region of central Spain. Goes with tapas and red meats. Grapes are carefully selected and fermented in temperature controlled tanks between 22-24ºC. The sensation of volume and sweet tannin is achieved by carrying out the malolactic fermentation in American oak barrels and continuing the ageing process for a period of 2 months. This is a young wine that remains in oak barrels for a short time. Valdepeñas takes its name from the ancient city of the same name that lies in a sun-baked river valley dotted with small rocky formations - Val de peñas (Valley of Rocks). The climate is extreme - temperatures reach 40 ºC in summer and up to -10 ºC in winter. The future of the D.O. lies with its red wines made from Tempranillo, which has the capacity to age well in crianzas, reserves and gran reserves. Store in a cool dark place. Best enjoyed within 2 years of purchase, once opened consume within 2 days. KNOW YOUR LIMITS UK CHIEF MEDICAL OFFICERS RECOMMEND ADULTS DO NOT REGULARLY EXCEED:.MEN: 3-4 UNITS DAILY WOMEN: 2-3 UNITS DAILY.DRINKAWARE.CO.UK ENJOY RESPONSIBLY.